Cleveland Browns strong safety T.J. Ward (43) intercepts a pass and returns for a touchdown during the third quarter against the Chicago Bears at FirstEnergy Stadium. The Pittsburgh Steelers may find out before they exit the field Sunday that they’re no longer in playoff contention, but it’s somewhat remarkable that they even head into Week 17 with a chance. Though they’ll need plenty of help, the Steelers will try to do their part in becoming only the second team in NFL history to start 0-4 and reach the postseason as they look for a 10th consecutive home win over the Cleveland Browns. Pittsburgh (7-8) was left for dead after going 0-for-September and again after back-to-back losses to fellow AFC playoff contenders Baltimore and Miami dropped it to 5-8, but the Steelers still have a chance to earn the conference’s No. 6 seed. They’d be bucking a serious historical trend to do so. Of the 185 teams in league history to lose their first four games, only the 1992 San Diego Chargers turned it around to qualify for the postseason. That team, however, won 11 of its final 12 games, while the Steelers are just trying to make the playoffs as a .500 team. They’ll need to beat the Browns and have both the Ravens and Dolphins lose in the NFL’s Week 17 early slate, then hope a Kansas City team that may rest some starters can beat San Diego in the late afternoon. "Isn’t that crazy?" defensive end Brett Keisel said of Pittsburgh’s improbable scenario. "We still are breathing and we’re going to continue to fight. We’ve got one more that we’ve got to win to even have a shot and that will be our focus." After years of riding their dominant defense, the Steelers have stayed alive in 2013 thanks to a productive offense. Pittsburgh has topped 30 points in consecutive games for the first time since 2007 after last week’s 38-31 win in Green Bay, and their 29.3-point average since Week 9 ranks fifth in the league. Ben Roethlisberger has thrown 14 touchdowns and two interceptions in the past six weeks, and his protection has made a big difference. He’s been sacked six times in that stretch, compared to 35 in Pittsburgh’s first nine games. "This team just keeps fighting," said rookie Le’Veon Bell, whose 124-yard rushing effort against the Packers was his first time in triple digits. "We faltered a bit at the beginning of the season, but guys are really fighting, trying to get into the playoffs." Cleveland safety T.J. Ward wants nothing more than to make sure that doesn’t happen. "I hate to sound malicious, but it’d help to put them where we are, out of the playoffs," Ward told the Browns’ official website. "We don’t want to see them succeed. It’ll be good, anytime you can knock somebody out of the playoffs." The Steelers haven’t had to fight particularly hard in the past decade when they’ve hosted the Browns (4-11). They haven’t lost at home to Cleveland since Roethlisberger came into the league, winning by an average of more than two touchdowns. Roethlisberger is 16-1 versus the Browns and has started eight of Pittsburgh’s nine straight home wins against them, averaging 9.86 yards per attempt and posting a 109.1 passer rating. Cleveland has had six different starters in that stretch, going for 6.02 yards per throw with a 65.2 QB rating. Jason Campbell will push that number to seven, and he’ll hope for a better finish after being knocked out of a 27-11 home loss to the Steelers on Nov. 24 due to a concussion suffered on a third-quarter strip sack by cornerback William Gay. The bright spot for the Browns in that defeat was the performance of Josh Gordon, who had 14 catches for 237 yards – 166 of which came once Brandon Weeden relieved Campbell. 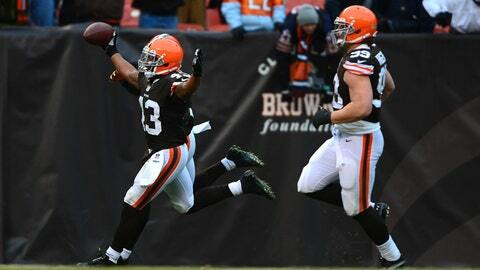 That was the first of Gordon’s consecutive 200-yard receiving performances. He’s had 813 yards in the past five weeks – 290 more than any other receiver in the NFL – with a stunning 479 coming after the catch. But after blowing a 10-0 lead in a 24-13 loss to the Jets in Week 16, the Browns are headed for their sixth consecutive finish at either 4-12 or 5-11 – something that’s hard for their players to swallow after a 3-2 start. "We still have one more game, and I don’t want to end my season like this," defensive back Joe Haden said. "I don’t think anybody in this locker room would. The team that we have and the players that we have, I would never have expected it to be like this. "… It’s got to change. This is not good enough." Haden is questionable Sunday with a hip injury, as is Jordan Cameron (concussion), who leads all AFC tight ends in receiving yards with 848. Cameron was held to three receptions for 32 yards against Pittsburgh last month. The Steelers’ second-leading receiver also may not play. Emmanuel Sanders, who has caught a touchdown pass in four of the past five weeks, suffered a knee injury against Green Bay.